Making the most of the summer heat wave a number of us attended the IWE, which had plenty to keep us busy and interested. Later in July we went to the Silverstone Classic weekend. 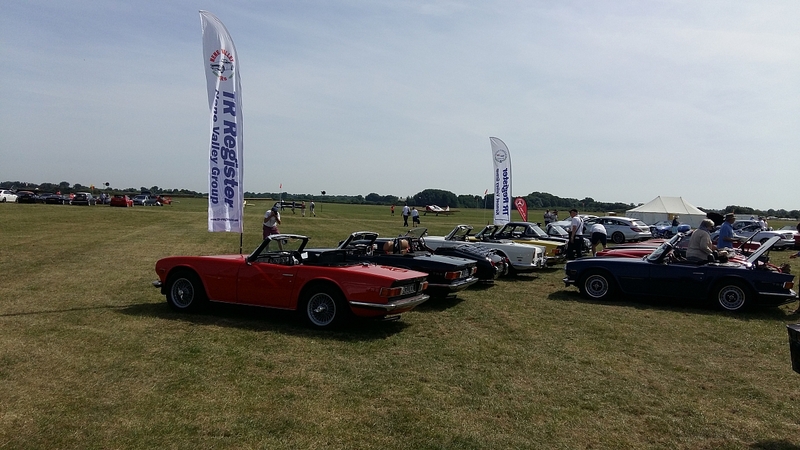 Great historic racing and a huge array of classic cars to wander round, we really enjoyed it. Back in June I was the only one in our group who was able to attend the Bicester Flywheel event-nice to spend time with the other groups there and a great event, especially the magnificent aerial displays, including the Battle of Britain flypast. I still put up our weathered but time-honoured group flag! By the time this is in print we will have held our Grand Summer Pub Quiz at the Aviator in August-about which more later! Since we all seem busy enjoying the cars I won't keep you long with this brief report and go back to driving instead of typing-just hope everyone is taking advantage of the current weather as much as we are!